MorphOS is a lightweight, highly efficient and flexible desktop operating system. It includes primarily proprietary as well as open - source components. Its many features range from a modern exceptionally customizable graphical user interface, which can utilize 3D hardware acceleration, to a high-performance Just-in-Time compiler that emulates the 68k family of processors and thereby allows to transparently execute legacy applications developed for the Commodore Ax00 series of computers. You will find a selection of core components described below. If you would like to get to know what hardware is supported, please visit our hardware compatibility section. For installation instructions, please go here. The free trial version is available for download on this page. Ambient is the native graphical shell of MorphOS. As its name suggests, the metaphor of an abstract enviroment is used rather than a traditional desktop which is often specifically associated with business and work. 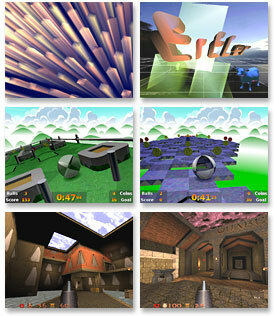 TinyGL was originally created by Fabrice Bellard as a subset of OpenGL® for embedded systems and games. It was designed with no hardware acceleration in mind at this time. Only the main OpenGL calls were implemented. The MorphOS version of TinyGL is only loosely based on the original implementation. It was rewritten to take full advantage of 3D hardware acceleration. Furthermore, it contains several carefully chosen MESA features. TinyGL on MorphOS provides a much richer feature set and surpasses the original's speed at the same time. - All primitives are supported, including lines and points (smooth or not) of variable sizes. Goa is included with MorphOS for compatibility reasons and represents a reimplementation of the Warp3D.library as well as the Warp3DPPC.library. It sits on top of MorphOS' native 3D API and allows to use various applications and games that were primarily written for PowerUP accelerator cards by Phase5 & DCE. Very accurate emulation. All known applications that make use of the original library, can be used. Extremely optimized. On the same hardware, Goa is always faster than the original. Handles misaligned data sent by buggy applications without relying on the built-in kernel emulation. The Poseidon USB Stack is a software solution that unleashes the possibilities of the Universal Serial Bus (USB) and the devices with USB interface, ranging from mice, keyboards, tablets, touch screens, joysticks, joypads, printers, scanners, webcams, digicams, flash card readers, zip drives, floppy disk drives, harddisks, memory sticks, ethernet adapters, scanners and audio adapters to less common things like power supplies, GPS location devices or finger print readers. For more extensive information about the supported USB devices, please visit our hardware compatibility section. Reggae is a new approach to media stream processing in MorphOS. Unlike the older datatypes system, Reggae features full support of streaming and is highly modularized. The term streaming refers to media files which are not fully buffered in memory. Instead, small portions of data are passed through a chain of connected objects, i.e. a pipeline. This way, the library can deal with extremely big media objects (or continuous streams) while keeping the memory footprint down to a minimum. Reggae's modularity lowers its memory usage even further. An old datatype class usually contained a format recognition, a demultiplexer (if any), a decoder and occasionally an encoder in a single shared library. Reggae, on the other hand, divides functionality into smaller modules which are being loaded independently. As a result, applications load only those specific modules which they actually require. Another advantage compared to datatypes would be stream abstraction. Stream handlers are separate modules now, and the system can be easily expanded to support new stream types. Developers are not strictly limited to the use of file and clipboard streams, but may still use them if they choose to. The library is able to handle compound streams such as video ones. A demultiplexer splits audio and video data, so every stream has its own decoder (loaded as a separate module), filters and a renderer. The entire decoding structure can be built automatically, including format and subformats recognition, with a single API call. Filters is another new concept not offered by datatypes which delegated the processing of decoded data to each application. Reggae filters enables the sharing of code of common audio and video processing algorithms. In addition, Reggae filters take advantage of AltiVec vector processing units, as found in Freescale G4 processors, which makes them very fast. Another useful feature is the built-in debugging system designed to simplify third-party development. Basically, MUI is a collection of libraries which allows programmers to easily create and maintain graphical user interfaces. Besides from a few very simple approaches, MUI was the first tool of this category to go a completely new and object oriented way. Constant development and continued support from users and programmers over the past years have made MUI by far the most successfull available GUI toolkit for the Amiga platform. In contast to many mainstream operating systems, the technical design of MorphOS was based on the modern concept of an individualized user interface. This culminated first and foremost in the outstanding customizability as offered by MUI which spawns from the global system down to the application level. Bringing personalization to the extreme, you can customize single applications individually. Apart from MUI, MorphOS includes many other advanced technologies that further this approach. MorphOS windows can have a variety of different designs including transparent shadows, hardware-accelerated colour gradients, rounded edges, and much more. Likewise, Ambient supports a wide variety of icon formats which maximizes your freedom to choose your preferred icon theme from a diverse pool of source and / or to develop your very own icon theme with a minimum of restrictions.